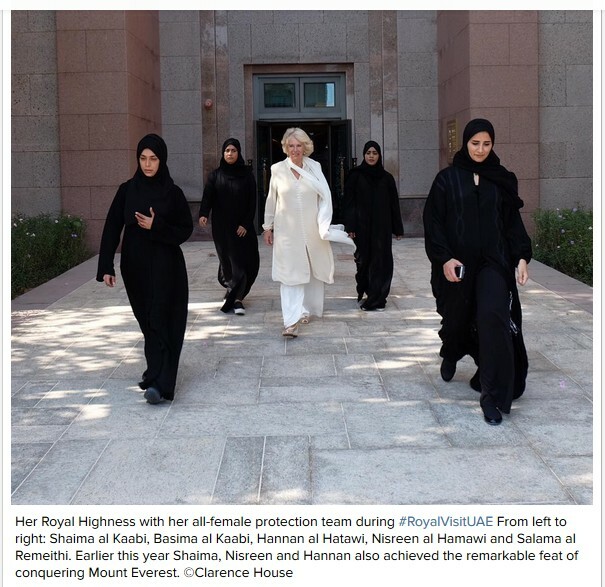 An all-female protection team flank British royal the Duchess of Cornwall, formerly known as Camilla Parker-Bowles, during a trip to the United Arab Emirates. The visit was part of a Middle Eastern tour with husband Prince Charles, as they visited Dubai, Abu Dhabi and Al Ain. They were protected by a group of women dressed in the traditional hijab and abayas. The five are members of the UAE’s presidential guard, which includes a total of 50 women. The group protecting the Duchess are all between the ages of 29 and 30 and are highly skilled in martial arts training and combat techniques. Shaima, Nisreen and Hannan have even climbed Mount Everest. Each woman has unidentified weapons hiding in her ensemble, ready to protect the Duchess. This entry was posted in TEXTS and tagged Middle East, Royal family, society, women's rights. Bookmark the permalink.